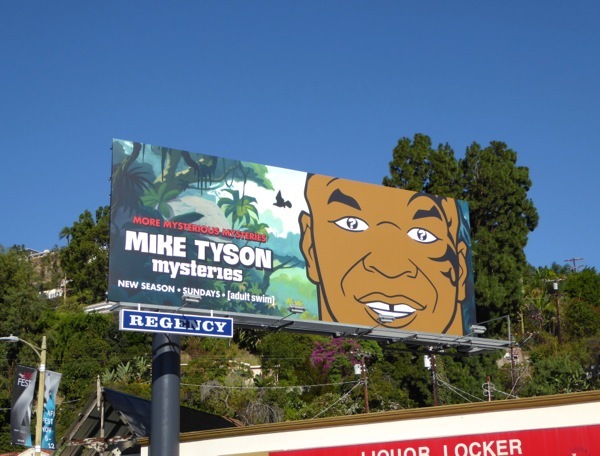 Adult Swim brings you their latest dose of insanity with the Mike Tyson Mysteries and a double-whammy of billboards to help kick off the new animated series. 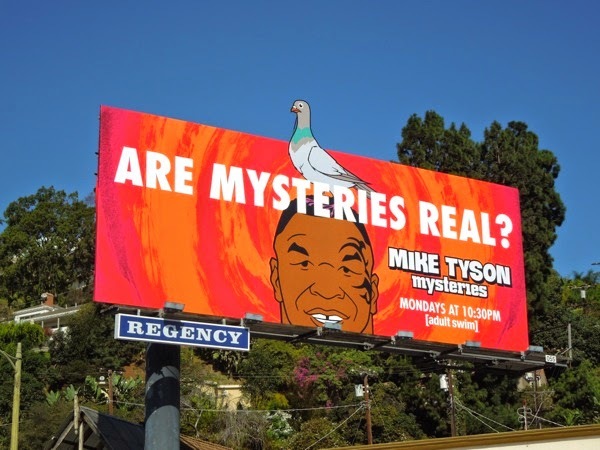 Think of the show as a spoof of Scooby-Doo, with Mike Tyson solving problems with his fists, accompanied by an eclectic team of plucky investigators including a ghostly 'Marquess of Queensbury', 'Yung Hee' an 18-year-old left of the boxer's doorstep as a baby and 'Pigeon', who is as you can see is a pigeon, who talks. 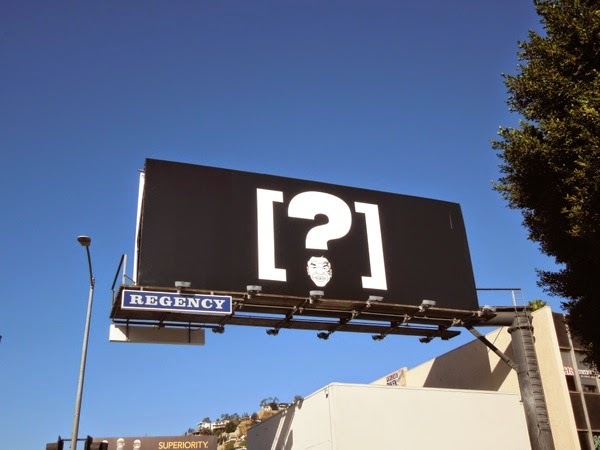 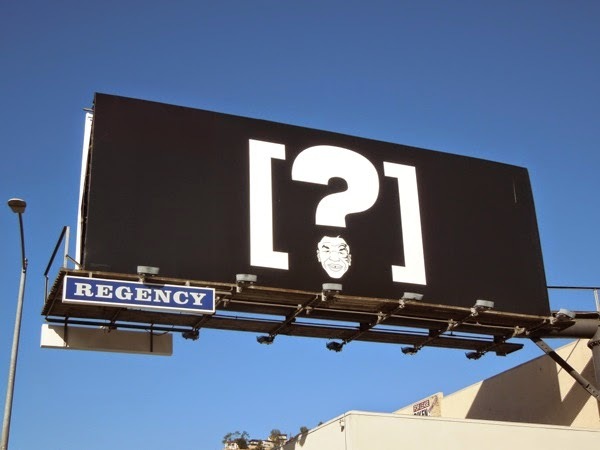 The 'question mark' teaser billboard was first spied at the intersection of Crescent Heights Boulevard and Sunset Boulevard on October 7, plus later further west a few billboards along in Adult Swim's regular Sunset Boulevard ad site location on October 15, whilst the 'pigeon' special extension billboard was snapped on October 21, 2014. 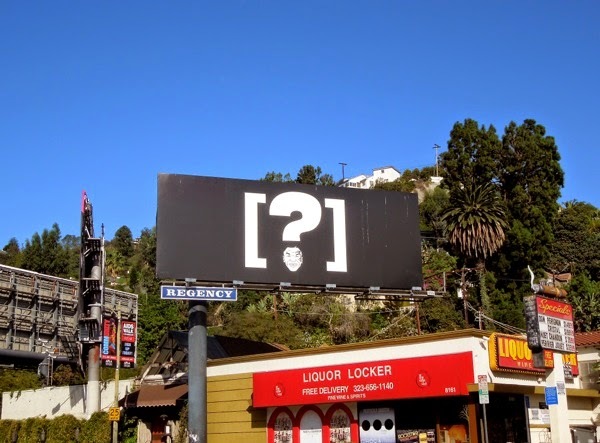 If you like these quirky ad creatives, be sure to check out more cool Adult Swim TV show billboards from recent years. 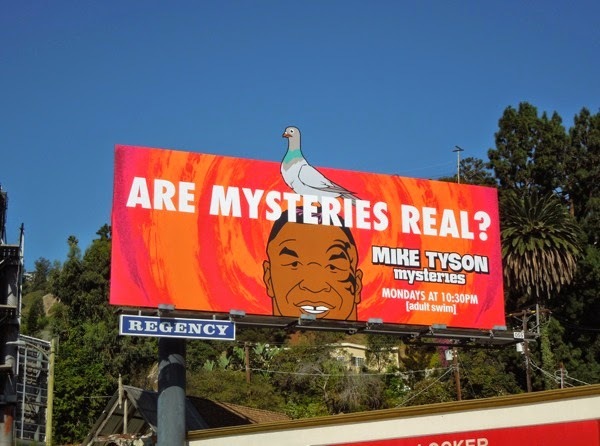 Maybe the real mystery here is, how does a guy who bites someone's ear off in the boxing ring get his own cartoon series?!? 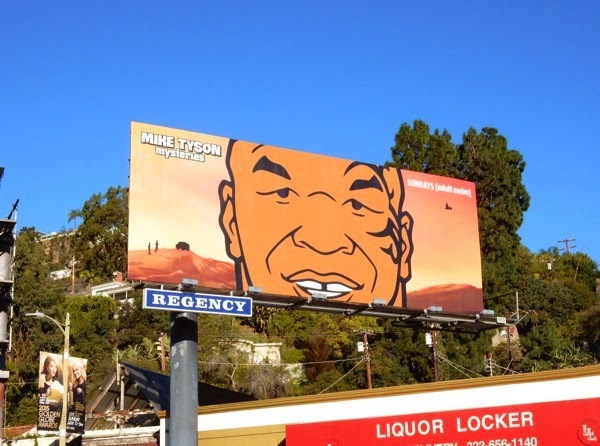 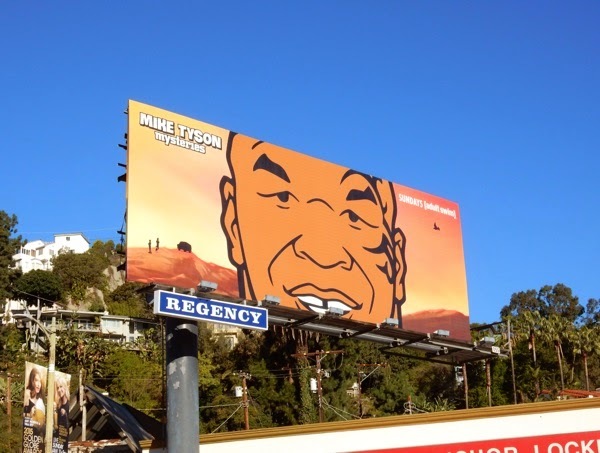 UPDATED: Now it's the New Year, Adult Swim has decided to give its Scooby-Doo spoof animated series, Mike Tyson Mysteries, a boost with another billboard with a closeup of his face with its distinctive tattoo, snapped in the same location along the Sunset Strip on January 14, 2015. 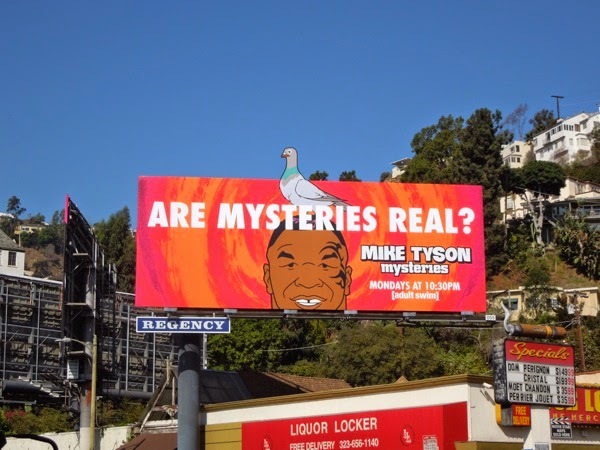 UPDATED: Mike Tyson Mysteries is back for a second knockout season with this sophomore season ad creative. 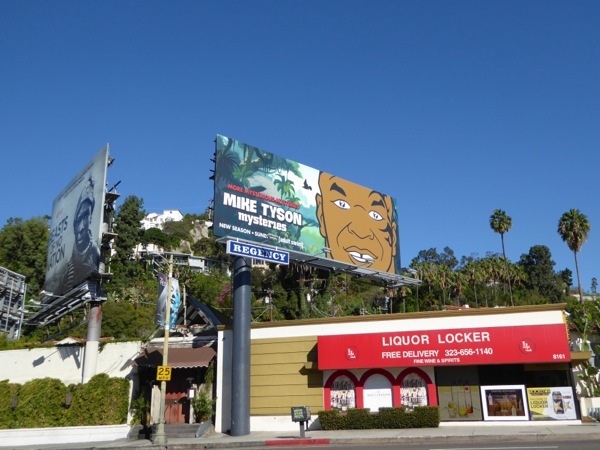 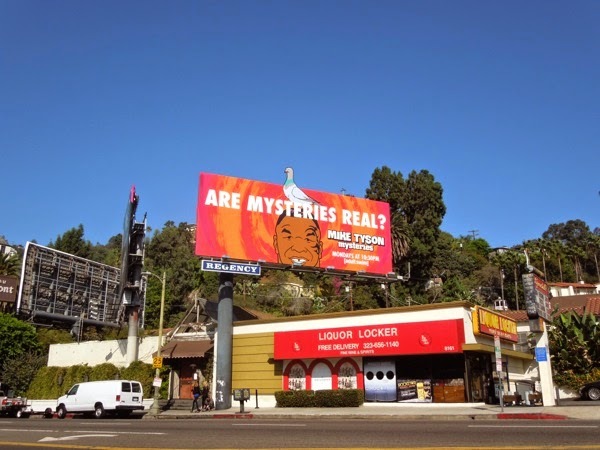 This billboard for the animated series with question marks in Tyson's eyes was snapped along the Sunset Strip on October 29, 2015.